The classics may seem like an endangered species in K-12 curriculums as they become increasingly incompatible with a wired generation accustomed to novelty, online interaction and instant gratification. Teens who now spend up to nine hours a day consuming digital media prize all things “epic,” except an epic itself. Who has time for Homer and Virgil’s dusty old words when the siren song of notifications beckon? A modern tragedy? Drama teacher and theater director Eddie Kim proves that it doesn’t have to be an either/or proposition. Kim and his students at the Pierrepont School in Connecticut marry the classical past and the digital now with mesmerizing performances that combine traditional literature, experimental theater and video games. Welcome to the world of Grand Theft Ovid. Kim knew he was onto something when a noisy and restless high school audience was reduced to rapt silence by his company’s performance of the myth of Niobe from Ovid’s Metamorphoses. The tragic tale of a mother whose children are murdered by vengeful gods is certainly Netflix-worthy material, but what really struck a chord with the students was that it was staged on Halo: Reach, part of the blockbuster sci-fi video game franchise. Students narrate dialogue from classic works to scenes of video games as avatars move through the action. The director decides which game scene will project on the main screen. Although the action takes place on a large screen, the flesh and blood performers and technical crew are also part of the show. Digital puppeteers, voice actors and technicians sit below the screen in a highly visible row of glowing computer terminals and game consoles, speaking lines, moving characters and managing the sounds and transitions. Kim’s decision to keep the performers and their computers exposed to the audience is a deliberate nod to traditional Japanese Bunraku puppetry and the writings of Bertolt Brecht. Kim and his students formed the EK Theater company, whose tagline compactly sums their vision: retelling classical stories through video games. Although based out of a school, EK Theater operates like a professional company. Kim and his students build the productions from the ground up, tour and perform in venues like the Brick Theater in Brooklyn and Harvard’s American Repertory Theater (ART). The company’s eclectic repertoire includes Poe’s The Tell-Tale Heart, Shakespeare’s Romeo and Juliet, an ancient Arabic fairytale and stories from Livy’s Ab Urbe Condita, which depicts the mythical founding of Rome. Middle and high school students in the company must meet the technical, artistic and logistical demands of a seasoned theater crowd. 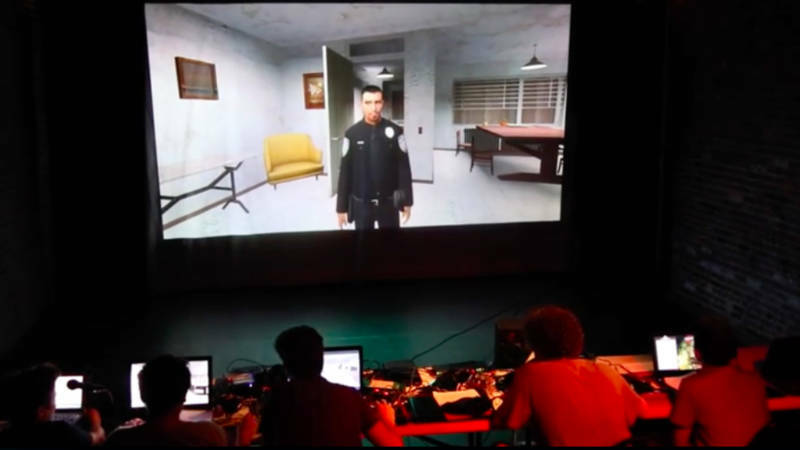 “My experiences taught me that you actually can take an idea, make it real and see people respond to it, ” said Connor Sedlacek, an alumnus of Kim’s troupe and the Pierrepont School, who now studies Classics at NYU Gallatin School of Individualized Studies and produces his own video game theater productions. He said the production helps underscore the importance of including hands-on, experiential learning opportunities in schools. Part theater, part machinima, part puppet show, Kim first conceived the hybrid art form in 2007 for The Tiny Theater Festival, where participants were restricted to perform 10-minute segments in 6-foot cubes. “It was while trying to figure out how I could present a piece in such a small space that the idea of using video games first occurred to me,” says Kim. “By projecting the MMORPG [massive multiplayer online role-playing game], World of Warcraft, to a screen mounted at the back of the cube, I could present an entire world for the audience.” He enlisted two students to help him and successfully produced W.B. Yeats’ Cathleen ni Houlihan on the ultra-popular online game. And in that 6-foot cube, a new art form was born. Harvard University comparative literature professor David Damrosch believes that new media, like video games, are the “new material conditions” by which stories are being told, and warrant the same degree of serious critical consideration as their print-based predecessors. “The study of classic literary texts is [not] fated to whither away,” writes Damrosch in Geopoetics: World Literature and the Global Mediascape. “Literary studies can thrive in the newly expansive media environment, bringing new audiences to our favorite authors.” Rather than resist or compete with new media, Kim’s approach reconciles past and present. It’s worth remembering that many of the stories from antiquity were originally transmitted orally, and were only later committed to the new technology of writing. Similarly, these enduring narratives can now be communicated through video games, a central (perhaps the central) source of storytelling in contemporary culture.